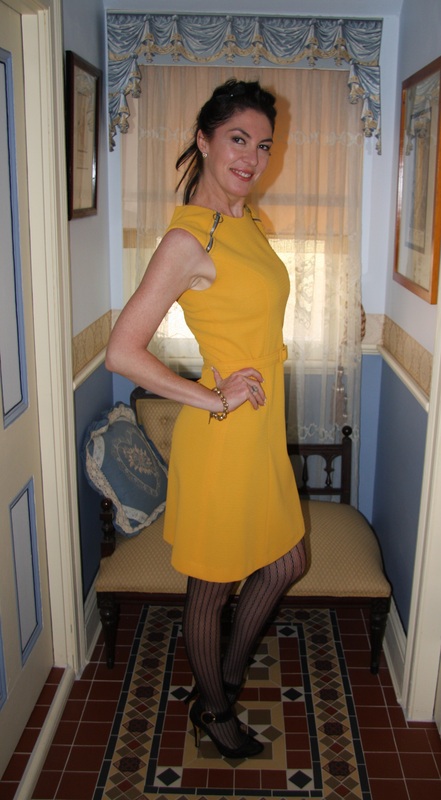 Outfit: Vintage (1960s) mod-style shift dress in golden yellow featuring zips to shoulders and matching belt. Shoes: Black patent heels with ankle strap and gold heel. Hair: Worn in a messy ponytail with a sequinned black bow clip. Accessories: Black fishnet hosiery, citrine heart shaped stud earrings, chunky gold belcher bracelet with filigree heart padlock. Never viewed Austin Powers…but I get the point. 🙂 I think. NOW—SHE LOOKS REALLY GOOD—IN YELLOW! A NICE SIMPLE DRESS DESIGN!